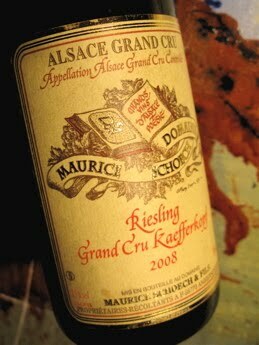 Kaefferkopf is one of the most heterogeneous Alsace Grands Crus. Here there are clay soils on top of granite, and gravel from the granite on calcareous marl. Yet Kaefferkopf always a special freshness, a lemon-like and powerful personality as well as vibrant overtones. The tradition used to be that Kaefferkopf was sold in the form of Gewurztraminer with a small amount of Riesling, but since the terroir became Grand Cru in 2006 the pure Riesling wine has become more common. >2008 Riesling Grand Cru Kaefferkopf, Maurice Schoech2008 Riesling Grand Cru Kaefferkopf has a young, tight, but rich aroma of pineapple, lemon and white flowers. The taste is strong, fruity, with clean and firm acids that promise a long life. Powerful! € 12.